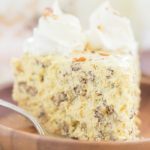 This quick & easy No Bake Pecan Cream Pie is so light, fluffy, and creamy, and also chock-full of toasted pecans. 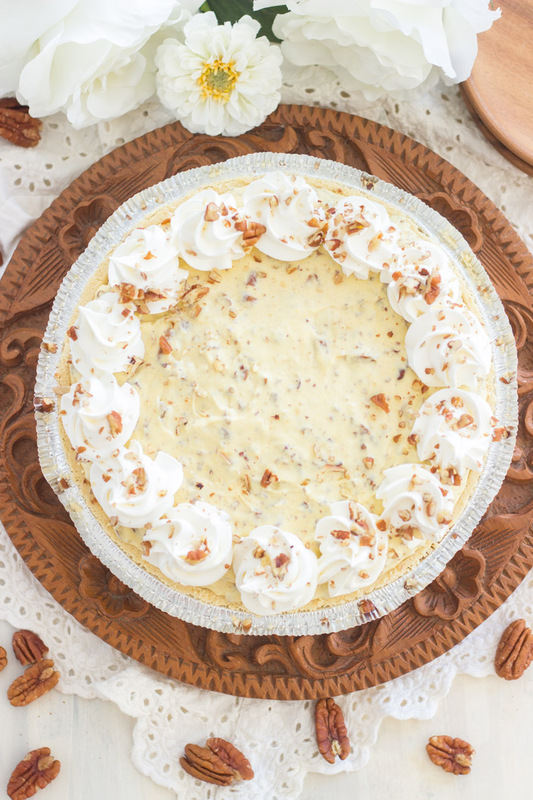 You can prep this No Bake Pecan Cream Pie in minutes, avoiding long days in the kitchen during the holidays! 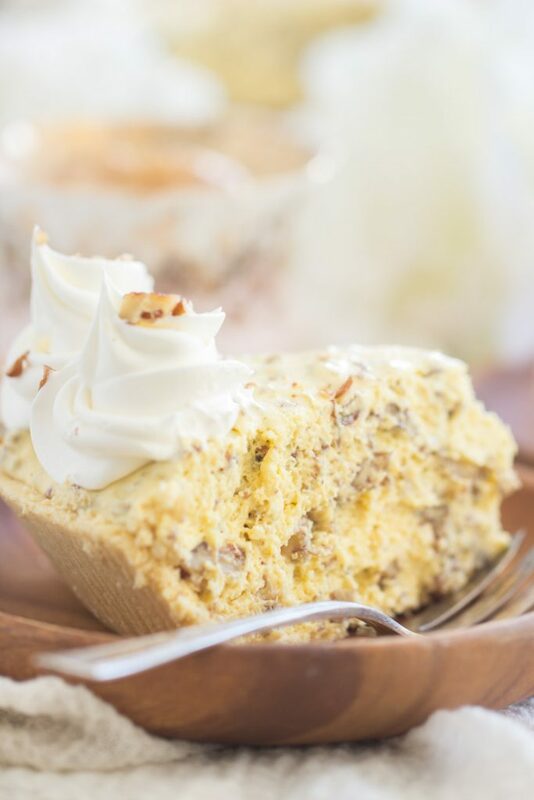 I can’t remember how I arrived at this Pecan Cream Pie idea exactly, but I constantly make notes in a wide variety of places when I have a recipe idea or an ingredient that I want to use soon. Lists upon lists of recipe ideas – on my laptop, on multiple notepads, in my iPhone… recipe ideas are everywhere. 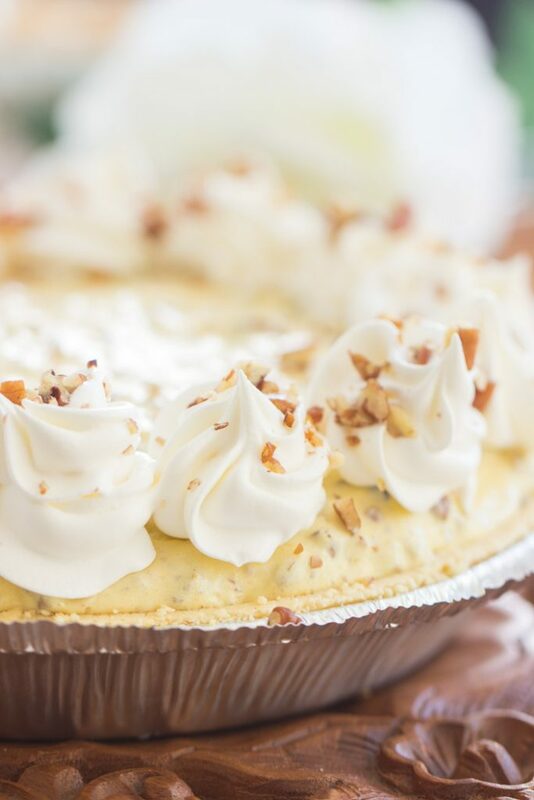 The idea to make a Pecan Cream Pie was born out of a productive brainstorming session, and that’s all I recall! Good story, huh? As soon as I thought of this Pecan Cream Pie, my second thought was: it’s going to be a no-bake pie. I wanted it to be super simple and quick to throw together. I want it to be a year-round kind of pie, one that you’ll think to make in spring or summer too, but something about it was giving me holiday vibes, so I’m sharing it now. 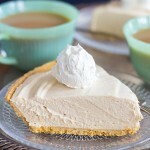 We make standard holiday desserts too, sure, but we also make some things that are off-the-beaten-path, like this No Bake Peanut Butter Pie recipe. That’s a holiday pie…. to us. 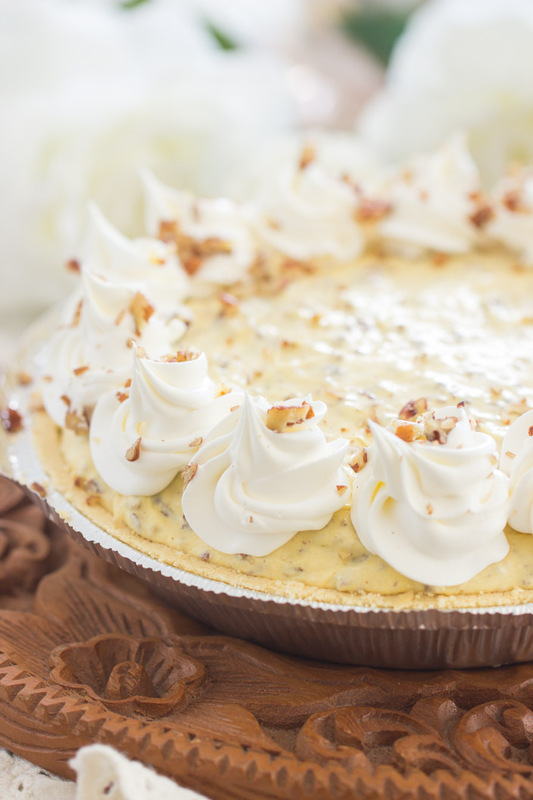 Maybe this Pecan Cream Pie will be a holiday pie to you! It will certainly minimize your time spent in the kitchen so that you have more time to spend with family and friends. This No Bake Pecan Cream Pie is a pudding pie technically. It just does not taste like a pudding pie though. I love pudding pies, don’t get me wrong, but this tastes much fancier and more luxurious than an easy pudding pie. 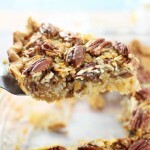 This Pecan Cream Pie only requires a few ingredients though, and about 5-10 minutes to prep. 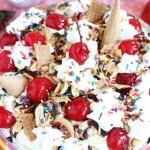 Its impact is sooo much more than a basic, easy, prepped-in-minutes pudding pie. 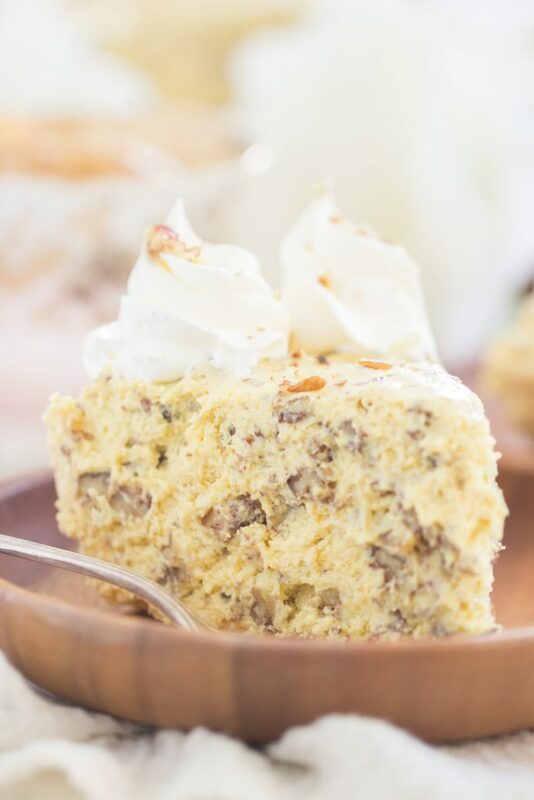 The texture of this No Bake Pecan Cream Pie is so light, fluffy, and creamy, and a bit mousse-y too. It’s also a mile-high. I love a really tall pie, and this delivers. 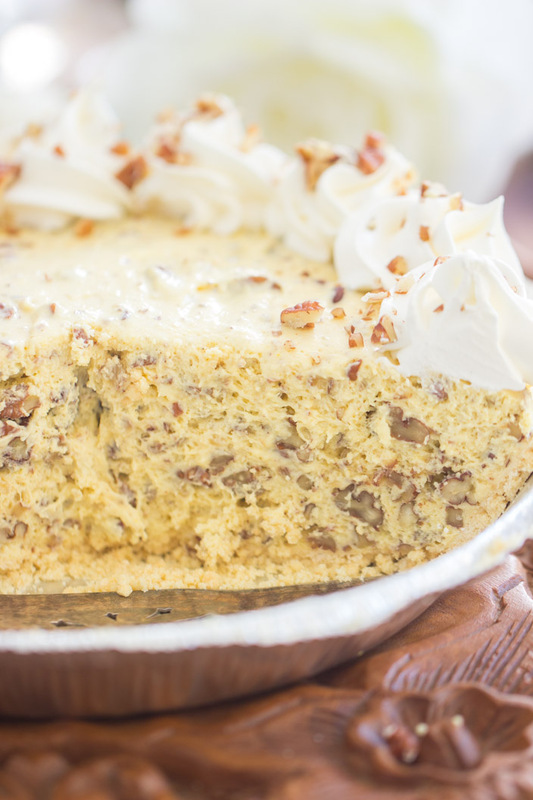 It’s loaded with toasted pecans – I didn’t skimp on those. 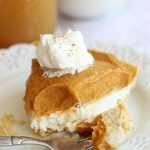 Their toastiness balances with the creaminess of the pie wonderfully, and they add texture, of course. Lots in the pie, and a healthy dose sprinkled on top, for good measure. 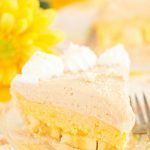 I have a bunch of simple no bake pie recipes, so check out some other options, if you’re interested! 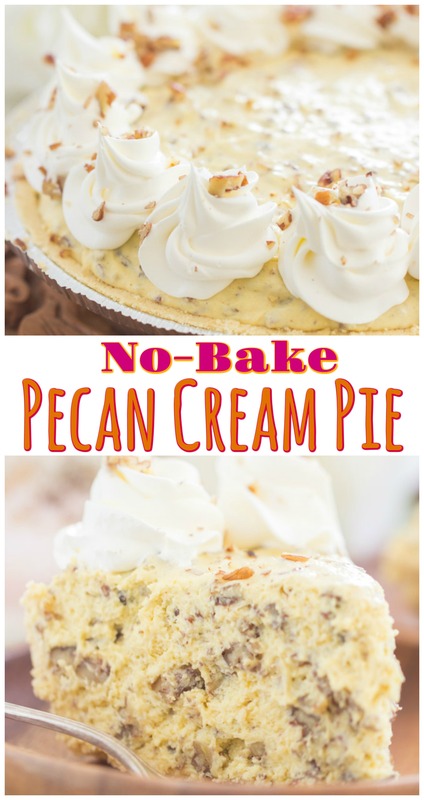 I also rounded-up a bunch in this post: Ridiculously Simple No Bake Pies that you can make in minutes! 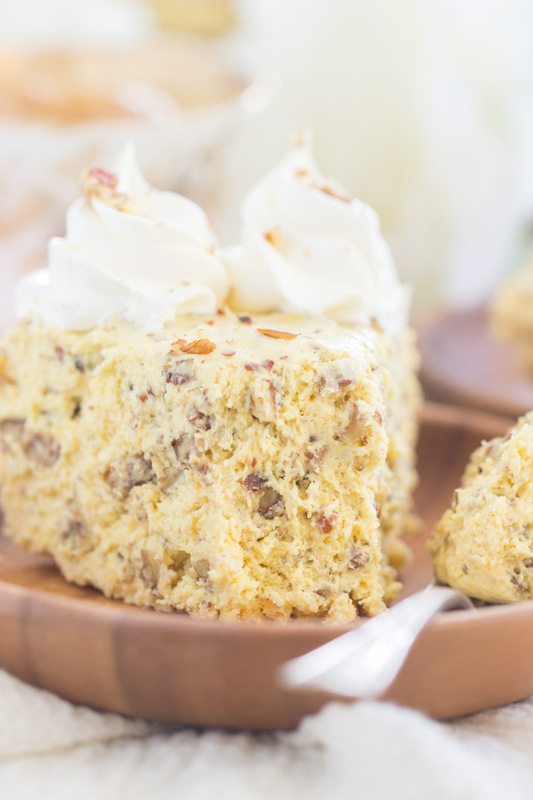 In a large bowl, mix together sweetened condensed milk, milk, pudding mix, 2 cups pecans, and butter extract. Spread into prepared pie crust. The pie crust will be VERY full, but it will all fit if you just keep building it up in the center. Careful not to let the filling seep over the edges of the crust. ? Garnish with remaining pecans and additional whipped topping, if desired. Cut and serve.